Published: Dec. 10, 2013 at 05:47 p.m. Updated: Dec. 10, 2013 at 08:24 p.m. The New England Patriots were rounding into form as true Super Bowl contenders ... before Rob Gronkowski suffered a season-ending injury. 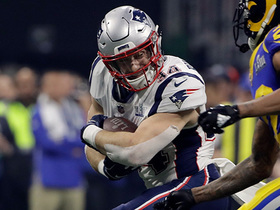 Popular opinion suggests such a substantial setback -- losing one of the best position players in football -- could send the Pats' season into a tailspin of sorts. Well, I'm not rolling with the popular crowd on this front. 1) The Patriots will continue to play power football. 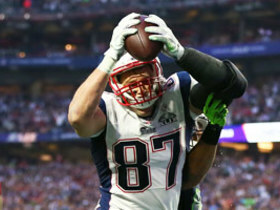 The loss of several notable pass-catchers during the offseason prompted the Patriots to morph into a power football team at the beginning of the 2013 campaign. New England operated primarily from run-heavy formations with multiple tight ends on the field to create advantages in the run game and force opponents into single-high safety coverage. 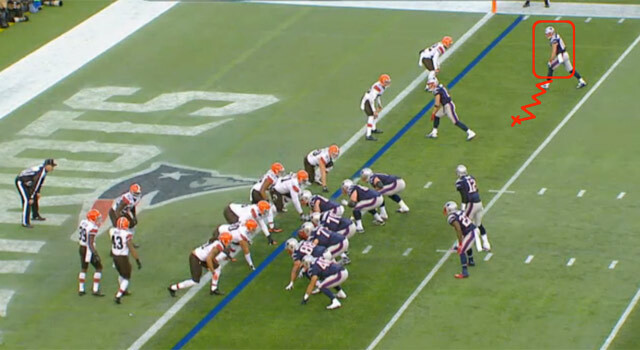 This allowed Tom Brady to control the tempo and mix up play calls at the line of scrimmage to exploit defensive weaknesses. Although the Patriots' offensive production waned without Gronkowski's blocking and receiving skills, the unit played well enough for New England to get off to a 5-1 start without a key playmaker. With Gronkowski now out of the lineup for the remainder of the season, I expect the Patriots to feature a strategy built around a power ground game and a vertical, play-action aerial attack. Looking at the All-22 Coaches Film from earlier in the season, the Patriots routinely ran the ball between the tackles from a variety of formations out of their "12" personnel package (one running back, two tight ends, two wide receivers). The versatility of this grouping allowed New England to use conventional two-back formations from the I-formation or employ some of the ace, ace-wing and ace-solo looks that create problems at the point of attack. 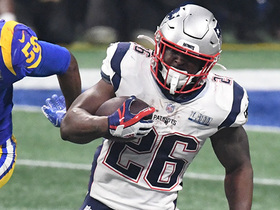 In addition, the downhill running styles of Stevan Ridley and LeGarrette Blount produced a steady diet of 4- and 5-yard gains that kept the offense on schedule. Of course, this approach is vastly different from the "bombs-away" tactics New England used in the past, but a consistent ground attack eventually will set up big-play opportunities off play-action. Looking back at some of the Patriots' explosive plays from this season, the common denominator has been the utilization of play-action fakes in the backfield. The Pats have cleverly designed a series of vertical passes that mirror the offensive line and backfield movements associated with their favorite runs. As a result, New England sets Brady up for easy home-run opportunities on two-man routes while keeping the franchise QB upright in the pocket with maximum protection at the line of scrimmage. 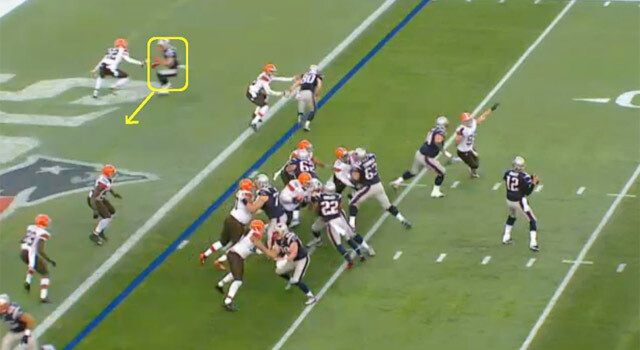 With the entire field available to Edelman, Brady tosses a bomb to his favorite target for a 43-yard gain. 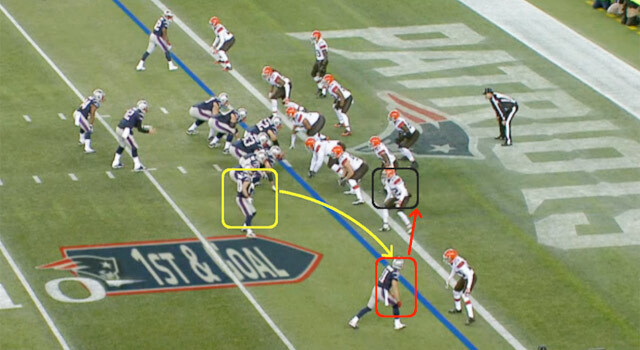 2) Expect Tom Brady to "dink and dunk" from spread formations. The loss of Gronkowski is clearly a blow to the Patriots' passing game, but the team has frequently employed a "small ball" strategy with Josh McDaniels at the helm. The savvy offensive coordinator routinely will call a series of quick-hitting routes from three- or four-receiver sets to take advantage of the soft-coverage tactics employed by opponents. Although these short routes frequently yield minimal yardage, the high-percentage throws keep Brady in rhythm and stretch the underneath coverage of the defense. 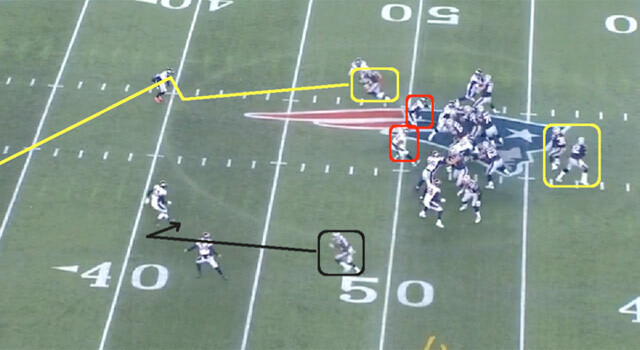 This eventually results in big plays when defenders vacate their zones to jump short routes, leaving receivers running free down the field, as evidenced by the video clip above and to the right. 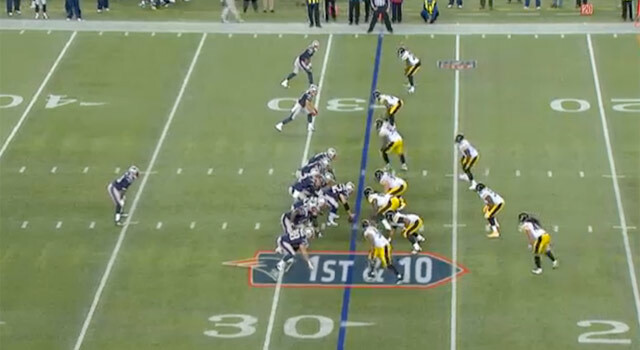 In addition to utilizing a "dink and dunk" passing game to help Brady, the Patriots will spread the field in a variety of empty formations to create simple pre-snap reads. This is a critical part of the Patriots' game plan because it allows the veteran signal-caller to quickly identify potential blitzes and audible to blitz-beaters like bubble screens or stick routes. 3) Shane Vereen will be the X-factor in the game plan. The Patriots' offensive staff does a great job deploying personnel at various spots in selected formations to create mismatches in the run or pass game. This has been the secret to the unit's success for years, with Kevin Faulk, Aaron Hernandez and Danny Woodhead all serving as X-factors at one time or another. With Gronkowski sidelined, I believe New England will use Vereen as the queen on the chessboard. I believe Vereen will continue to serve as the team's primary runner in "11" personnel packages (one running back, one tight end, three receivers). He has a knack for finding creases against sub-defenses on inside zone and stretch plays, which makes him challenging to defend with nickel personnel. 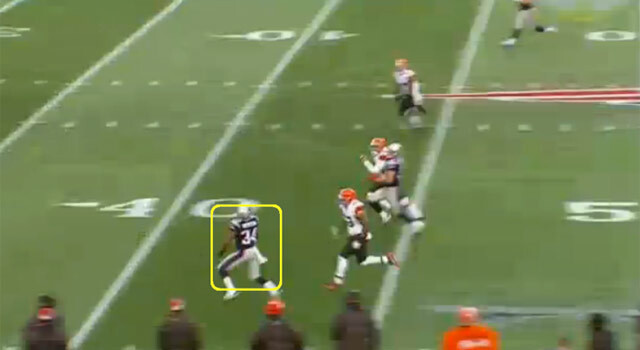 In the video clip to the right, notice how, while the Patriots direct the run to the nickel corner, Vereen slips inside to take advantage of a crease at the point of attack. 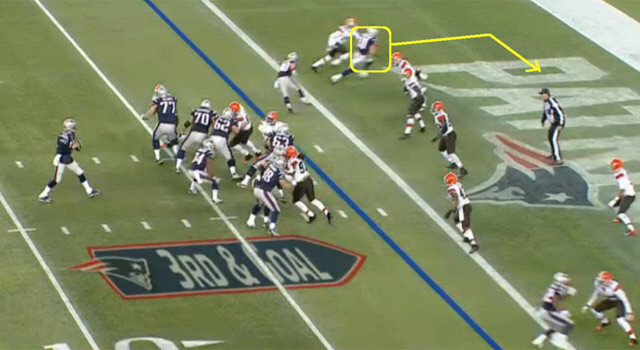 Click here to see a clip of Vereen running an inside zone play against a nickel package. 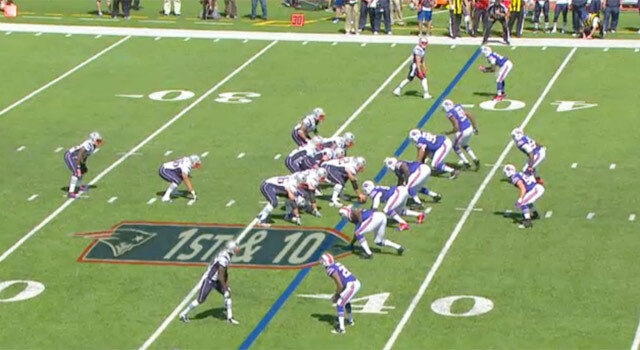 These are the kinds of runs Vereen can provide against sub-defenses designed to stop the Patriots' passing game. Given Vereen's effectiveness running inside or outside from one-back formations, defenses have a tough time slowing him down. In the passing game, Vereen is a matchup nightmare. He capably runs any route from any position on the field. Consequently, defensive coordinators have a tough time deciding whether to cover him with a linebacker or a defensive back in space. 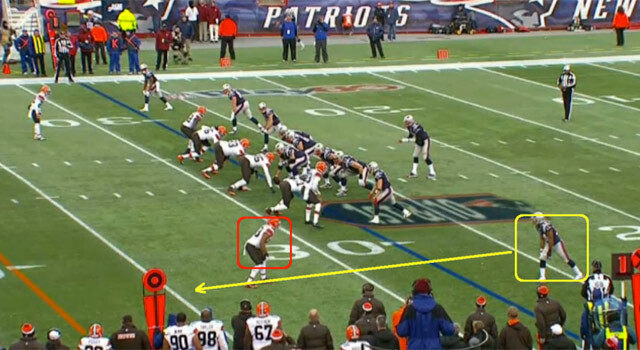 If defensive play-callers trot out a sub-package, the Patriots can position Vereen in the backfield to execute one of the aforementioned run plays. 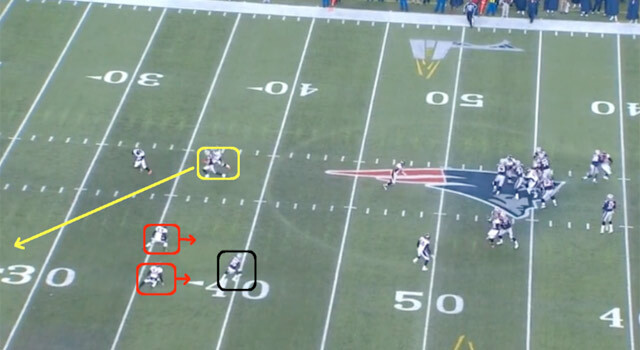 If they keep base personnel on the field, New England can align Vereen outside and run a variety of isolation routes. 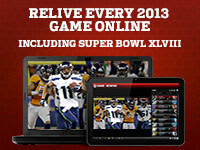 The versatile running back catches the ball in stride for a 50-yard gain. 4) Julian Edelman and Danny Amendola will become big red-zone targets. It's hard to replace Gronkowski's production in the passing game, especially in the red zone. The fourth-year pro has scored 43 total touchdowns in his 50-game career. Checking in at 6-foot-6 and 265 pounds with long arms and a huge frame, Gronk is impossible to defend on post-ups in the end zone. 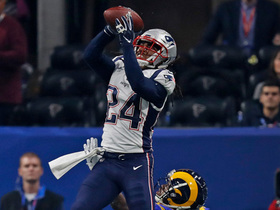 Brady has taken advantage of the wide strike zone, repeatedly targeting the big-bodied pass-catcher on seam routes or post-corners against man coverage. Without Gronk owning space in the middle, Brady will rely on Edelman (5-10) and Amendola (5-11) to run a variety of picks and rub routes on the perimeter. 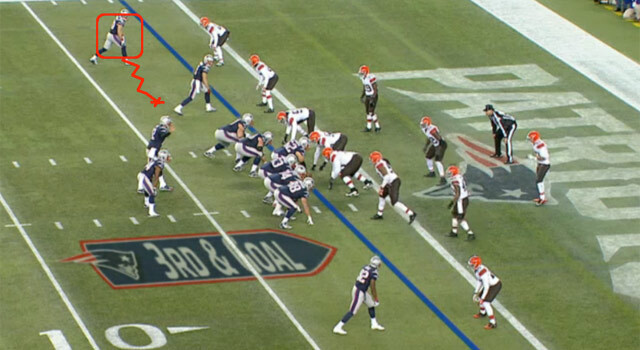 If that concept sounds familiar, it's because Brady used the same approach with Wes Welker for years. Studying the tape, I noticed that the Patriots already employ a variety of picks and rub plays with the duo. By featuring the top two receivers in the concept, New England typically is assured that one pass-catcher will work free. 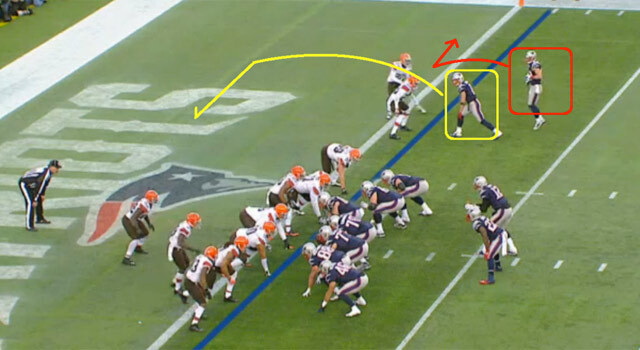 Let's take a look at what we should expect to see from the Pats' red-zone package. Edelman leaves the cornerback standing still and snags the ball for a critical two-point conversion. 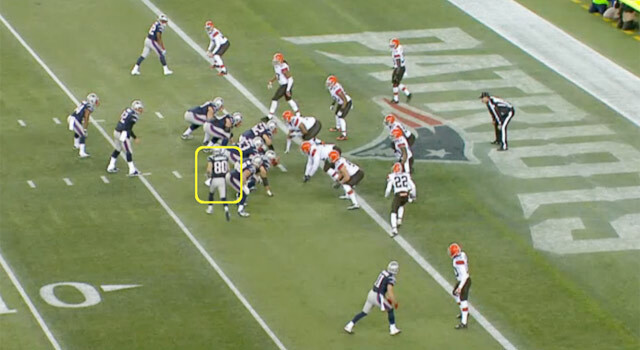 As a result, Edelman notches six more points on the same play. 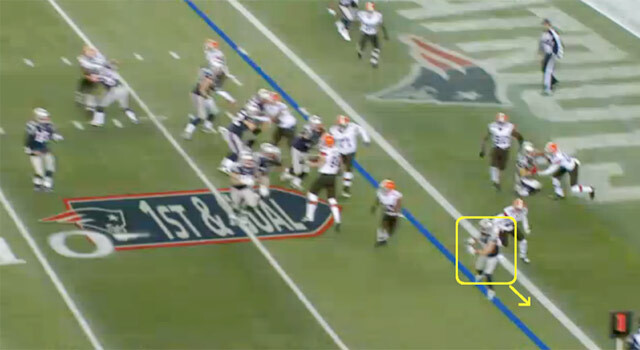 With the defender unable to get around the pick immediately, Brady quickly hits Amendola for a 1-yard touchdown pass. 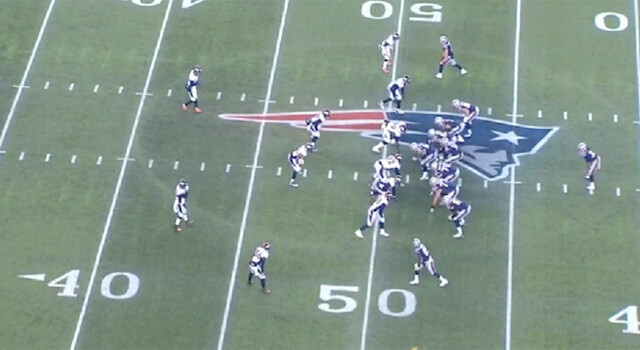 And this play, of course, completed a miraculous comeback victory for New England. With the Patriots adept at executing a variety of pick and rub concepts near the goal line, we shouldn't expect the scoring to drop off significantly with Gronkowski out of the lineup.